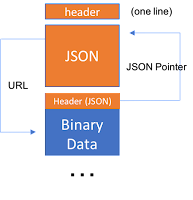 In a scenario in which I am involved we have an embedded server that answers the status of activities and devices combining structured data (JSON) and medium sided binary data (images). 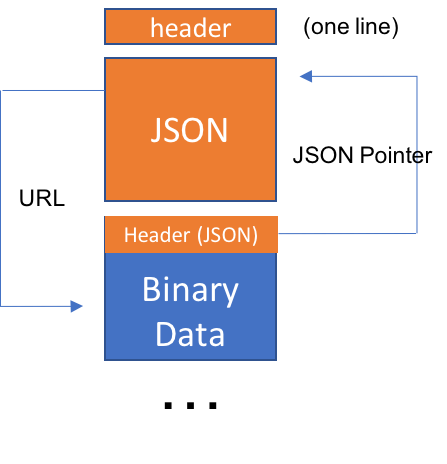 This post and the associated github repository (here) presents a AJAX response that combines JSON data with one or more binary payloads. processing on the client side that patches the JSON replacing stub URIs with the new Blob URIs. The proposed approach works both with the custom encoding and with a multipart/related approach. Depending on the Content-negotiation and configuration the server decide which URI use. In the JSON-bag case the JSON contains a refdata. The Blob header points to the JSON location so that it can be patched on the client side. On the client side the JSON bag is parsed and each binary block is mapped to a Blob URI. Then the JSON is patched by replacing the linkdata with the final blob url. In this way the html page can use the URL for direct use (e.g. img element). When the URL is not needed the application can use the linkdata URL for manually accessing the ArrayBuffer. The server-client demo, implemented in C++ with the embedded server Mongoose shows the case of AJAX request: a JSON-bag is loaded containing a number of images that are shown in the page. For the impatient I have made an offline version that takes data from the HTML page available here: https://eruffaldi.github.io/jsonbag/indexoff.html. This demo takes an embedded JSON-bag file, simulates an AJAX request and behaves like the previous one.